Mighty Ear is the revolutionary sound amplification system that is affordable and discreet. The Mighty Ear (formerly known as the Magni Ear Plus) is the revolutionary sound amplification system that is affordable and discreet. Lightweight and compact, you won&apos;t even feel like you&apos;re wearing it. Whether you&apos;re in the theater, watching TV, listening to soft music or just having a quiet conversation, you will hear loud and clear. 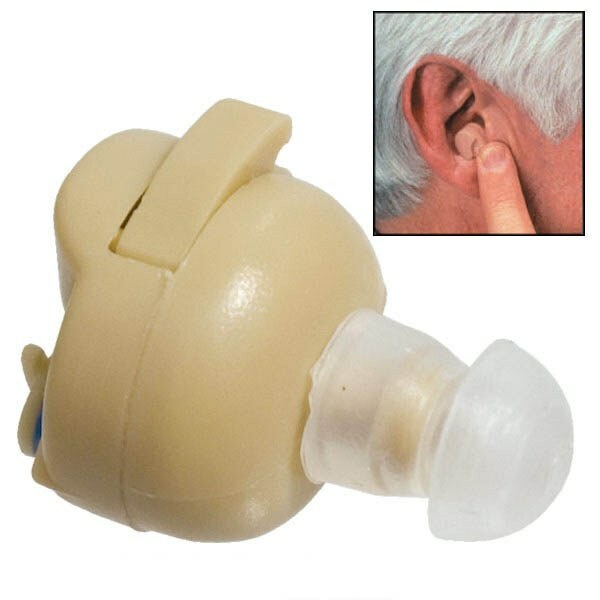 While some hearing devices can cost hundreds or even thousands of dollars, Magni Ear Plus is a remarkable value! The Mighty Ear comes with 3 sizes of soft tips that can be worn in the right or left ear to give you a perfect fit. For your convenience, Mighty Ear also comes with 5 batteries. Say goodbye to the frustration and embarrassment that comes with not being able to hear properly or large, bulky hearing aids, and say hello to Mighty Ear. Lightweight personal sound amplifier maximizes the natural ability to hear sounds and conversations. Has features of expensive sound amplifiers for a fraction of the cost.